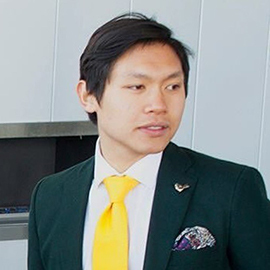 Keith Diaz, a fourth-year co-op student in the Business Administration program at Laurier’s Lazaridis School of Business and Economics, is the 2016 winner of the Equitable Life Co-op Student of the Year Award, which recognizes outstanding students in the co-operative education program at Laurier. Diaz worked with CIBC’s Digital Strategy and Innovation team in Toronto as a Junior Digital Strategist. He spent much of his term at CIBC Live Labs, an innovation centre that develops prototyping, product deep dives and research. Diaz established himself early on as an integral part of the team, earning him the added responsibility of product lead for a cross-country collaboration with National Australian Bank. “Keith’s initiative and commitment set himself apart from his peers when it comes to delivering high quality work and out of the box thinking,” says Matthew Bennett, Director, Digital Strategy and Innovation. Diaz promotes the development of public speaking skills on campus through the Golden Speakers Club which he founded in 2014. The club has experienced significant growth in membership, reach and engagement with a student executive and five portfolios, establishing partnerships with Brymark Productions and Labatt Breweries and launching a new strategist. Diaz is currently on exchange at ESC Rennes School of Business in France. Keith Diaz is recognized for the award during National Cooperative Education Week, which is celebrated March 20-24 through the Canadian Association for Cooperative Education (CAFCE). Currently there are 80 CAFCE member institutions across Canada and the U.S. representing more than 80,000 students.